Will road diet plan ease the traffic situation along EDSA? The Metropolitan Manila Development Authority (MMDA) will soon make exclusive motorcycle lanes along EDSA once the road diet proposal pushes through. 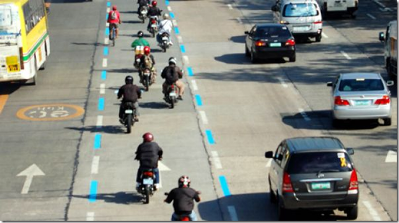 According to MMDA General Manager Jojo Garcia, the agency is considering to convert the new lane to exclusive motorcycle lane, right next to the yellow lanes utilized by public utility buses, while the existing blue lanes will be non-exclusive and can be used by private vehicles. During the Metro Manila Council meeting yesterday, the city mayors agreed to draft a resolution to study the road diet plan. They also assigned the MMDA to conduct traffic evaluation studies of the appropriate speed for the proposed 3.05-meter lanes. Under the road diet plan, EDSA roadways will be segregated accordingly: two lanes for passenger buses, one lane for motorcycles, and the three remaining lanes are for private vehicles. The road diet plan also aims to create new lanes for wider sidewalks, pedestrian islands, crossways, bike lanes, and green space.